A soft case won’t protect your AR 15 as good as a hard case. But let’s be honest – it’s a little unfair to compare hard and soft cases head-on. Because soft AR 15 cases offer you something else. So, today we’re going to take a look at the best soft cases you can get – specifically for your AR 15. P.S. The individual reviews are going to be pretty detailed, so here’s a 30-second summary for you if you’re short on time. Our Pick: Savior Urban Warfare Tactical is the best soft case you can get for your AR 15. 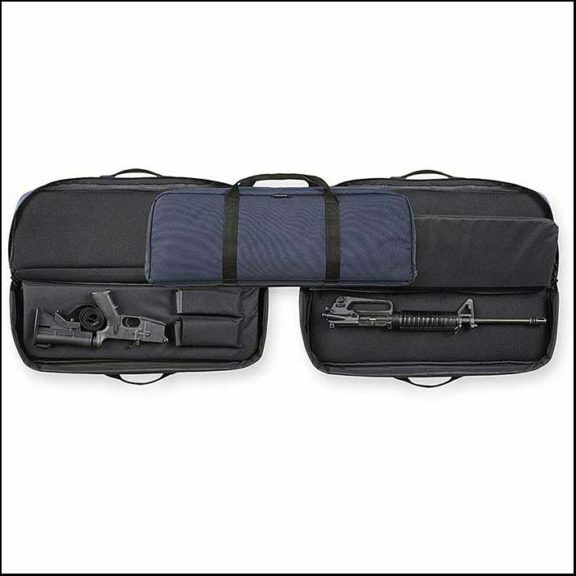 It’s a double-rifle case that has all the top-of-the-line features you could possibly want (rugged construction, pockets, backpack straps, opens flat, etc.). If you only want to have only one gun bag for all your range needs, look no further. Best of all, this case is backed up by Savior’s no-questions-asked lifetime warranty. 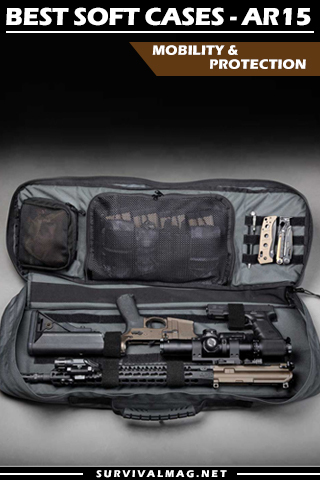 Budget Choice: Savior Patriot is the best budget single-rifle case that you can get. It’s smaller than the Urban Warfare case above, has a sturdy construction and plenty of outer pockets for storing all your necessities. There are many similar cases on the market. But what makes this one a winner is Savior’s no-questions-asked lifetime warranty (like our #1 pick above). Best Concealed: We’ve included 3 concealed models in this list. If you want the absolute best, go with Haley Strategic Partners (it’s tough as hell and made in the USA – the last soft rifle bag you’ll ever need to buy). Then there’s UTG’s concealment case that will get you decent quality the price. Finally, Bulldog’s Ultra Compact is the “smallest AR case on the market”, but it’s not for everyone… and you’ll know what I mean when you see it. Starting with the most obvious, remember to measure the length of your AR 15. They vary on the type of the rifle. Then, get a case that’s at least 2 inches longer than your rifle. If you use optics (and you probably do), measure the height of your rifle together with the scope before buying. A reflex sight will fit anywhere, but quite a few cases will struggle with larger scopes. Side note: This might be obvious, but you’d be surprised at the number of people who buy a rifle case and discover that their gun doesn’t fit with the scope on. If you search for soft gun cases or range bags on Amazon and look closely, you’ll see that the same models are being sold under different brand names. But even though those 3 bags look the same, they’re not built the same. Some of them are better than others, as this clever Amazon reviewer found out upon closer inspection. So keep in mind that these Chinese-made cases do work. You just need to be picky with the company that you’re buying them from. The good thing is – we’ve already done the research and picked out the winner among them. 3 out of top 7 soft AR 15 cases that we’re recommending are made by Savior. Lifetime Warranty – No other company except for Voodoo (that is priced 1/3 higher than Savior) offers a lifetime warranty on their cases for a reasonable cost. Customer Service – Savior goes above and beyond to ensure that you’re satisfied with your case. Proof: When this customer complained about a line of velcro stitching failing on his case, Savior sent him a full replacement case. If that’s not amazing customer service, then I don’t know what is. Solid Quality – And if you haven’t yet, I highly recommend you read this short detailed comparison on Amazon about the quality of Savior cases vs. their competition. It really showcases the quality differences of two cases that look 100% alike. It’s the same one that I linked to above. Flying & Travel – One thing you can’t do is flying with your gun in a soft rifle case. That’s against the TSA guidelines. You might also have problems when crossing state borders, depending on the local gun laws of the state you’re in. Protection – But even if you could fly with it, I wouldn’t recommend it. Because a soft case won’t protect your rifle all that much. And it’s a well-known fact that airports give luggage rough treatment. The last thing that you’d want is for your AR 15 to arrive at a new destination with a bent barrel. Safety & Security – Finally, even on the best soft cases you can only lock the zippers. Anyone with a knife or a pair of scissors will be able to get to your gun. Side note: If you’re not sure whether you should go with a soft or a hard case for your AR 15, we recommend that you consider getting a hard case as your first case (Check Out Our Review). They offer more security and last longer. Best of all, today’s hard AR 15 cases cost about the same as soft cases with many of them being Made In USA. 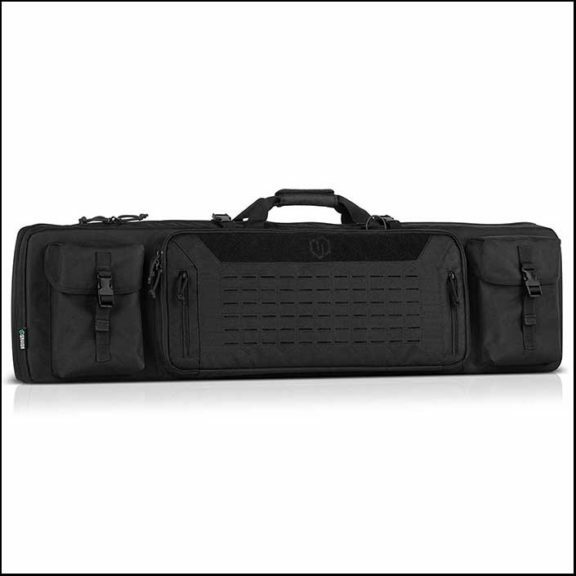 With Savior Urban Warfare Tactical you get a semi-professional soft rifle case without breaking the bank. It packs more features and is built better than any other case at this price point. Combine that with a lifetime warranty and you have yourself the best soft case for AR 15 (and one of the best rifle cases on the market overall). If you want to do better than Urban Warfare Tactical, you’ll have to go for Haley’s U.S.-made cases that run ~$100 more than this one. The padding is thick enough – think of something like a thin yoga mat inside this case. The padding lets the empty case stand up and lean against the wall without collapsing. All of the above gives you a rigid, sturdy, and durable design. Side note: You can fit 2 scoped rifles into this one, but it will be tight. Even if you don’t carry 2 rifles, you never know when you’ll need the extra space. What’s great about these soft cases is that bigger ones are not a lot heavier than the smaller ones. So instead of carrying 2 or 3 bags to the range, you can fit all your gear one. This bag opens flat which makes it comfortable to use, load, and unload. You can carry this bag on your back as a backpack. Or use the included shoulder sling to carry it on your shoulder. Both straps are comfortable and well-padded, I could barely feel the bag on my back. There is a separate zipper pocket for storing the backpack straps and the sling. This keeps them from dangling around and improves the overall usability of the bag. Inside, you have velcro straps for your rifles and handguns to prevent them from sliding out of the case. There is also a removable center divider pad separating the two rifles. That way, you can make it into a bag with one big internal compartment. First, the case is on the large side since it’s made to fit two rifles. And while I like the extra space, it can be too big if you don’t carry a lot of gear. If you’re absolutely positive that you need a smaller case, have a look at our #3 pick. Second, the zippers could be bigger. I couldn’t fit a 1/4″ standard padlock in there. Standard gun locks will fit if they’re not rubberized (as they often are). 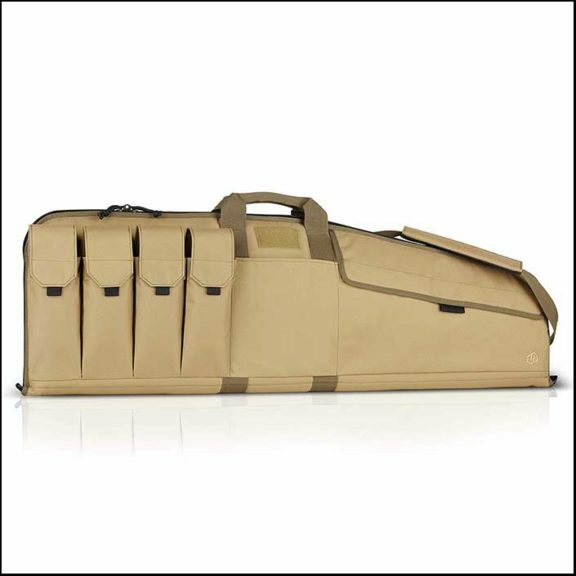 Savior Urban Warfare is probably the best soft double rifle case that you can get for the money. For AR 15 or otherwise. You’re getting fantastic value for the price. The only other case that comes close in the same price range is the “American Classic” below – keep reading for the review. 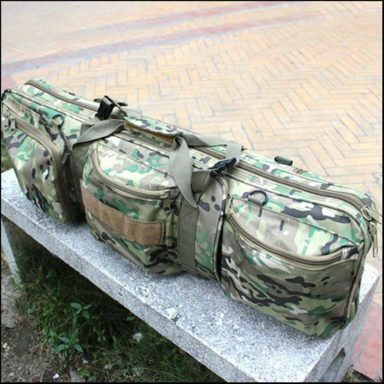 Savior American Classic bag is very similar to the Urban Warfare Tactical above. Still, American Classic has fewer pockets than the Urban Warfare Tactical above and doesn’t open flat. For those 2 reasons, we feel that you’ll get more value for your money with the Urban Warfare bag. For some reason (probably it’s because of the classic design), Savior American Classic is the most popular soft rifle case on Amazon. So I had to include it in the review and take a closer look. The question is, does this case have anything going for it besides from the iconic design? As I mentioned, the American Classic bag comes with the roughly the same features as the Urban Warfare model. I wouldn’t be surprised if both cases were made by the same factory. So, instead of repeating what’s already been said, I’m going to take a look at the differences between the two bags. And tell you why exactly the Urban Warfare bag comes out as the winner for the best soft AR 15 case overall. But how serious are these faults? The bag is less durable because when you have your rifles in this bag, their weight will push on the bag and force it to open more, putting stress on the zippers. While the zippers themselves are maxed out and can’t move more. So, in time that extra stress might end up breaking the zipper. As with all Savior cases, American Classic has small zipper holes – too small to fit a standard padlock. I’ve found that a standard gun lock will work if it doesn’t have the exterior rubber coating (like many of them do). Lastly, the insides of the interior barrel/stock pockets are lined with thinner fabric and not the 600D nylon. This might make the inner pockets susceptible to tearing in the long run. Even considering all of the above, I can see how you might like the classic “range bag” design of Savior’s American Classic. And I can’t blame you – treat it gently, don’t stress the zippers too much, and you’ll be fine. It’s the #1 Amazon bestseller for a reason. Savior patriot is the best single AR 15 soft case on our list. It retails roughly 50% cheaper than the double cases above. Affordable price coupled with Savior’s lifetime warranty makes this case the best “value for money” choice out there. There are 3 different colors available – Tan, Black, and Olive. Note: The 35″ case should fit your AR 15 just fine, but this is going to depend on the size of your particular rifle. Get a bigger case if you need space for more gear. The height is enough to fit most scoped rifles out there, even with additional customizations (extended mags, bipods etc.). The shell of the case is made out of 600D nylon with double stitching all around. The velcro is very strong – both on the outer pocket and on the rifle fastener inside. Inside, there is a foam interior padding to keep your gun protected. There are also two velcro straps that can be adjusted to fit your individual firearm. There is also a row of MOLLE that you might find useful. There are 4 mag pouches and 2 larger compartments on the side of the case, one of the compartments covered with velcro. The compartments have plenty of space for storing smaller necessities (firearm tool, cleaning snake etc.). But they’re not big enough for stuff like hearing protection. You can carry the case with either the adjustable shoulder strap or the classic handle. It’s easy to remove the shoulder strap and store it inside the case. Unfortunately, there are no backpack straps on this one. When I first got the case I noticed that the velcro snaps on the outer mag pockets were a little too long. With some effort, I could pull out a loaded magazine without actually undoing the velcro. While it might seem like a little detail, carrying loaded mags in an “open” compartment like that is illegal in some states. After speaking with Savior, I found out that the velcro straps on the mags can be adjusted from the inside of the case. So keep that in mind – you’ll have to adjust those when you first get the case. 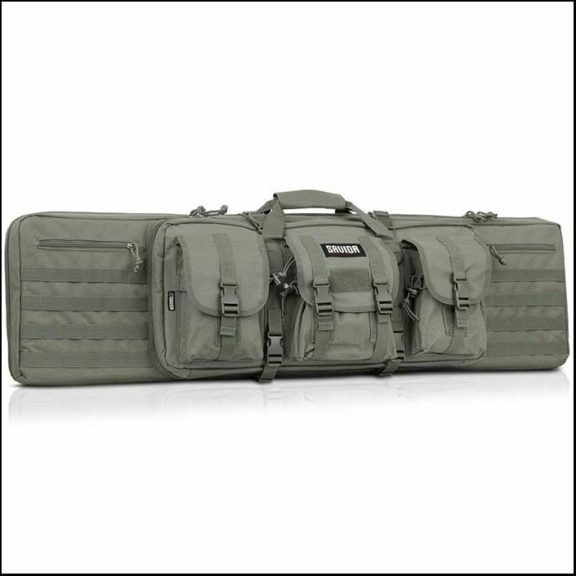 You won’t find a better single rifle case for this price. And if you will, it will have fewer features and come without a lifetime warranty. Savior’s Patriot bag is your best choice when you’re on a budget. With Bulldog Ultra Compact, nobody on the street will have the slightest idea that you’re carrying a rifle. It’s just too small for one… right? And that’s what I love the most about it – this case doesn’t scream “tactical” and “GUN” when you walk around with it. Since the case is smaller, it will also fit in places where normal cases won’t. First things first – the picture might be misleading. You’re not getting 3 bags – only one. The picture shows 2 sides of the same bag – one for each half of your gun. 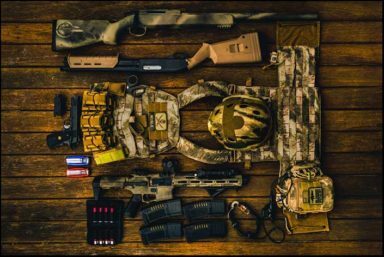 You take your rifle apart and pack it in – that’s how it works. 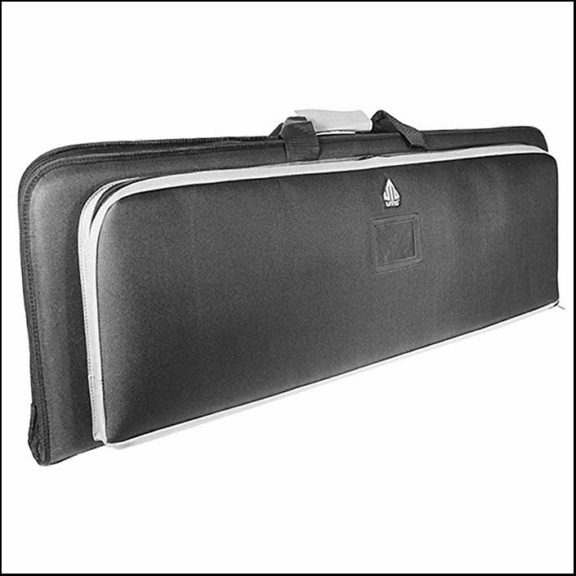 This bag is small – make sure that your rifle parts are maximum 27″ long. That’s the internal length of the bag. With that being said, any normal-sized AR 15 will have no problem fitting into this bag when taken apart. The zippers are very heavy, and so is the outside nylon fabric. Reinforced carry straps. I couldn’t confirm whether the shell of this case is made out of 600D Nylon or not, but it feels strong. Lots of padding on the inside and the built-in magazine holder will fit two 30-round magazines. There is a divider between the two parts of the bag. The divider is easy to remove, as it’s attached to the spine of the bag with velcro. That’s where the positive things end, unfortunately. There are no straps to secure your gun inside and no MOLLE webbing either. Some way to secure your gun inside is a must-have, and it’s disappointing to see that Bulldog hasn’t included that. Without the straps on the inside, the case feels durable and convenient, but incomplete. There is no shoulder strap and no D-rings to attach one. The magazine holder doesn’t have velcro, so the magazines can slip out when moving. You’ll either need to be careful or fix them up yourself. The zippers are not lockable. While you can run a padlock through them, it’s just not the same as a dedicated locking zipper like the Savior bags above have. Finally, this bag is small. If you have optics on your rifle, bigger scopes won’t fit when mounted. Bulldog Ultra Compact is great if you need to maintain good relations with people who don’t like guns. Like an anti-gun neighbor, for example. This bag looks like an oversized laptop case if anything. At the price of a backpack, this case is great at what it does – even considering its downsides. But with so many features missing, it’s hard for me to call it a proper “gun bag”. Haley is a name that shouldn’t need an introduction. Their gear is being used by operators worldwide, including inside conflict zones. This is serious stuff. In other words, Haley is as professional as it gets when it comes to any kind of tactical gear. So it’s no surprise that Haley Incog is the highest quality bag on the list. It’s Made In The USA, the price is high, but at the end of the day you get what you pay for. As you can see from the image, the Incog bag is made to blend into the crowd. This bag doesn’t look like a gun case and you won’t raise any eyebrows when moving around. And I also like that it looks very clean. They did a great job on the design. This bag can carry an assembled 14.5″ carbine or a broken down SPR. Only best materials used here – 1000D Cordura outer body, YKK zippers, reinforced gussets, and handles. This bag is unbreakable. With the dual zipper system, you can open up the entire bag fast from any side. The pocket that you see on the outside will expand when you open it. It kind-of puffs out – as some of the soft travel suitcases do. And quite a lot fits inside, too – see the video below for more details. And then you’ve got your shoulder sling that can be stowed away under a velcro flap on the backside of the bag. Very professional and clean. Inside, there is a lot of velcro for fastening your firearm. The velcro can be customized to fit your individual rifle. These guys didn’t cut any corners when designing this bag. The bag is Made In America as you’d usually expect from Haley. The only downside – except for the price – is that there is no webbing/straps in the zippered compartment on the outside of the case. I would also have expected more velcro and MOLLE on the inside of the bag, considering how much it costs. If you do want a soft case for your AR that’ll last forever – Haley’s your best choice. With that being said, this bag will be an overkill for most people out there because of its high price. Check it out and decide for yourself. This is the cheapest soft AR 15 case that you’ll find on the market. This case retails around $20 and will your rifle the most basic level of protection. Pitbull case is as basic as it gets. The only thing more basic than this is keeping your AR in a gun sleeve/sock. Doesn’t sound promising, right? But the padding is decent and the inside of the case is lined with a soft felt-like material. The single zipper works smoothly and I found the stitching to be very even and consistent on my model. Unfortunately – as it tends to be with cheaper bags – there are more downsides than upsides here. There ain’t a single pocket on this thing. Not a single one. You’ll have to get a second bag for your magazines and shooting gear (or just dump them inside and hope for the best). Only buy this case if you’re absolutely positive you don’t need any pockets. Since you have only one zipper, there’s no way to lock this bag. If that one zipper fails, it’s sayonara. Large scopes might not fit, as this case is not that big. If you have a large scope on your AR, double-check the width before buying. It seems that this bag ships straight from China, judging by the time it takes to arrive. Looking at the reviews, defects seem to be more common than with Savior bags above. More specifically, zippers tend to break and there are occasional stitching quality problems. Finally, this case comes without a shoulder strap – which will make carrying it a pain over longer distances. What’s my opinion here? Pay a couple of dollars more and get yourself a proper case, like Savior’s budget Patriot model. The price difference is not that big and you’ll get more bang for your buck. 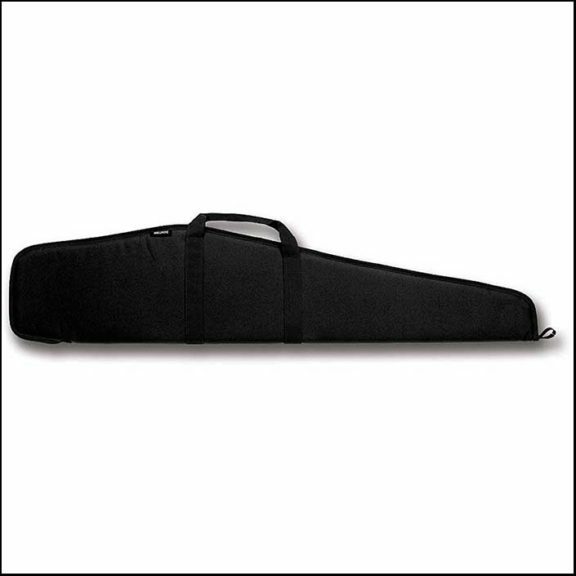 Still, if you’re on the lookout the cheapest soft case you can possibly get for your AR 15… this is the one. Just don’t expect too much of it. There are two compartments inside of the case. The main/inner compartment can fit 2 rifles and has movable velcro straps to keep them in place. The padding is decent and sufficient to keep your firearm safe. If anything, this case is on the heavy side, weighing just under 5 1/2 lbs unloaded. The case comes with backpack straps and D-rings for a shoulder sling. BUT there is no shoulder strap included with the package, so keep that in mind. The case is not good at all for scoped rifles. It’s not big enough to fit two scoped rifles. You’ll either fit 2 rifles without optics, or one with a scope. I find the shoulder strap uncomfortable. First, I had to get a separate shoulder strap because it’s not included. But the D-rings themselves are positioned in the middle of the case. So, if you want to carry the case on your shoulder, it has to be vertical. When you unzip the front compartment, the zipper doesn’t go far enough for the flap to lay flat. This makes putting things in and taking them out uncomfortable. Finally, the case is sold as “covert” but it has a big UTG badge sewn onto it. You can easily remove it with a razor, though. For a simple soft AR 15 case, I would take one of Savior’s cases over this one any time of the day. But you won’t find better than UTG if you’re looking for a concealed full-rifle case that is also capable of carrying 2 (albeit unscoped) rifles. If you’re still undecided between a hard and a soft case, have a look at these articles from 511 tactical and lynx defense. They explain the difference pretty good. Also, don’t forget to check out our guide on Best AR 15 Hard Cases. 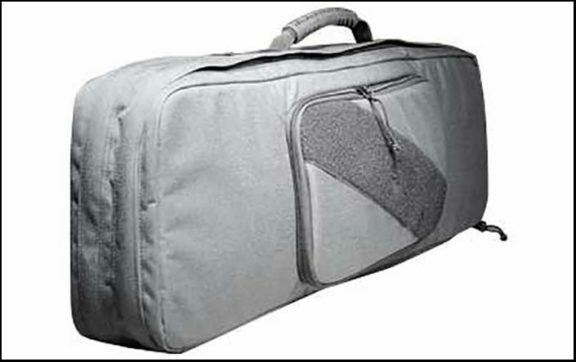 Waterproof Soft Rifle Cases – Do They Exist? Unfortunately, you’ll have to pay a premium for a waterproof soft rifle case. They do exist, but if you need it to be waterproof you’re better off going with a hard case for your AR 15. With that being said, soft cases have plenty of water resistance. A soft case will survive most encounters with water – unless you go swimming with it or leave it in a downpour for a long time, that is. I hope that this article helped you find the best soft case for your AR 15. If you’re still undecided at this point, just get the Savior Patriot and call it a day. It’s hard to go wrong at that price point. Did you like the choice of cases? What about the features we covered? The structure of the list? Have you used any of these cases? Do you think that we missed anything?